, an eminent English antiquary and biographer, was the son of Thomas Wood, bachelor of arts and of the civil law; and was born at Oxford, December 17, 1632. He was sent to New-college school in that city | in 1641; and three years after removed to the free-school at Thame in Oxfordshire, where he continued till his admission at Merton, 1647. His mother in Tain endeavoured to prevail on him to follow some trade or profession; his prevailing turn was to antiquity: “heraldry, music, and painting, he says, did so much crowd upon him, that he could not avoid them; and he could never give a reason why he should delight in those studies more than others; so prevalent was nature, mixed with a generosity of mind, and a hatred to all that was servile, sneaking, or advantatageous, for lucre-sake.” He took the degree of B.A. 1652, and M.A. in 1655, As he resided altogether at Oxford, he perused all the evidences of the several colleges and churches, from which he compiled his two great worts, and assisted all who were engaged in the like designs; at the same time digesting and arranging all the papers he perused; thus doing the cause of antiquity a double service. His drawings preserved many things which soon after were destroyed. In 1665, he began to lay the foundation of “Historia & Antiquitates Universitatis Oxoniensis;” which was published in 1674, in 2 vols. folio. The first contains the antiquities of the university in general, and the second those of the particular colleges. This work was written by the author in English, and so well esteemed that the university procured it to be translated into Latin, the language in which it was published. The author spent eight years about it, and was, as we are told, at the pains to extract it from the bowels of antiquity. 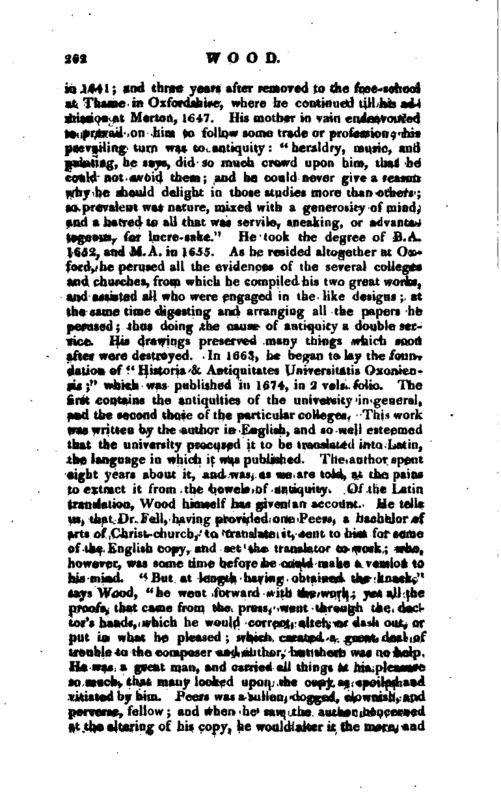 Of the Latin translation, Wood himself has given an account. He tells us, that Dr. Fell, having provided one Peers, a bachelor of arts of Christ-church, to translate it, sent to him for some of the English copy, and set the translator to work; who, however, was some time before he could make a version to his mind. 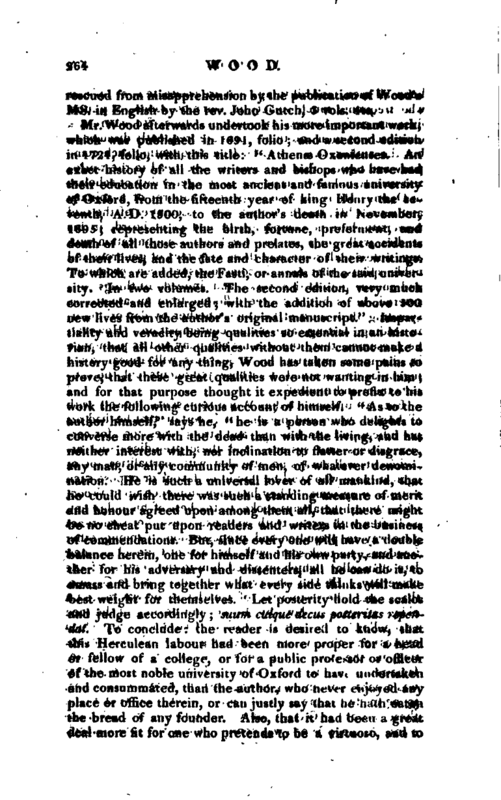 “But at length having obtained the knack,” says Wood, “he went forward with the work; yet all the proofs, that came from the press, went through the doctor’s hands, which he would correct, alter, or dash out, or put in what he pleased; which created a great deal of trouble to the composer and author, but there was no help. He was a great man, and carried all things at his pleasure so much, that many looked upon the copy as spoiled and vitiated by him. Peers was a sullen, dogged, clownish, and perverse, fellow; and when he saw the author concerned at the altering of his copy, he would alter it the more, and | study to put things in that might vex him, and yet please his dean, Dr. Fell.” And he afterwards complains, how “Dr. 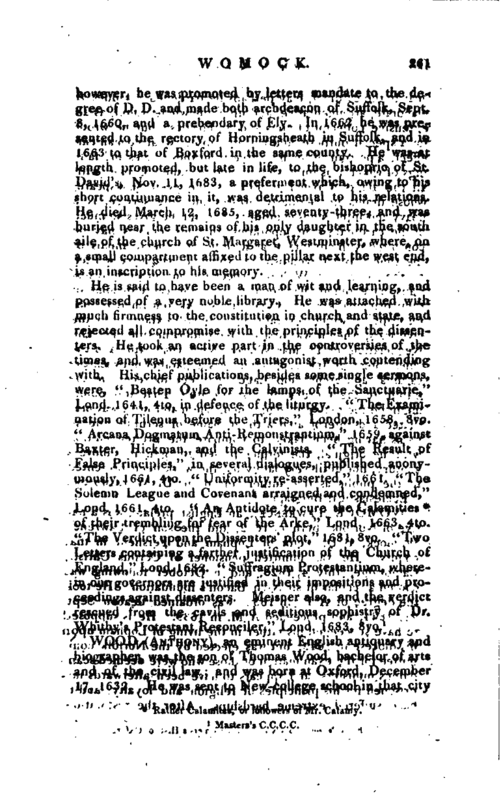 Fell, who printed the book at his own charge, took so much liberty of putting in and out what he pleased, that the author was so far from dedicating or presenting the book to any one, that he would scarcely own it.” Among the “Genuine Remains of Barlow, bishop of Lincoln, published by sir Peter Pett in 1693,” 8vo, are two letters of that prelate, relating to this work. In the first letter we have the following passage: “What you say of our late antiquities is too true. We are alarmed by many letters, not only of false Latin, but false English too, and many bad characters cast on good men; especially on the Anti-Arminians, who are all made seditious persons, schismatics, if not heretics: nay, our first reformers are made fanatics. This they tell me; and our judges of assize, now in town, say no less^. I have not read one leaf of the book yet; but I see I shajl be necessitated to read it over, that I may with my own eyes see the faults, and (so far as I am able) endeavour the mending of them. 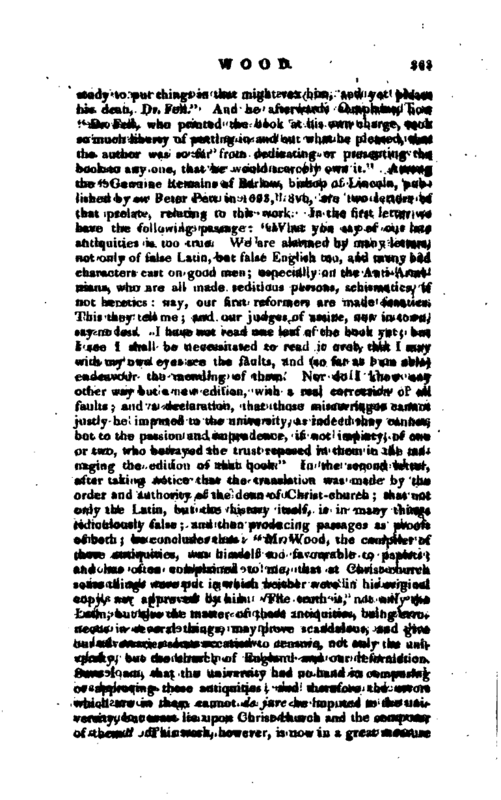 Nor do I know any other way but a new edition, with a real correction of all faults; and a declaration, that those miscarriages cannot justly be imputed to the university, as indeed they cannot, but to the passion and imprudence, if not impiety, of one or two, who betrayed the trust reposed in them in the managing the edition of that book.” In the second letter, after taking notice that the translation was made by the order and authority of the dean of Christ-church; that not only the Latin, but the history itself, is in many things ridiculously false; and then producing passages as proofs of both; he concludes thus: “Mr. Wood, the compiler of those antiquities, was himself too favourable to papists; and has often complained to me, that at Christ-church some things were put in which neither were in his original copy nor approved by him. The truth is, not only th Latin, but also the matter of those antiquities, being erroneous in several things, may prove scandalous, and give our adversaries some occasion to censure, not only the university, but the church of England and our reformation. 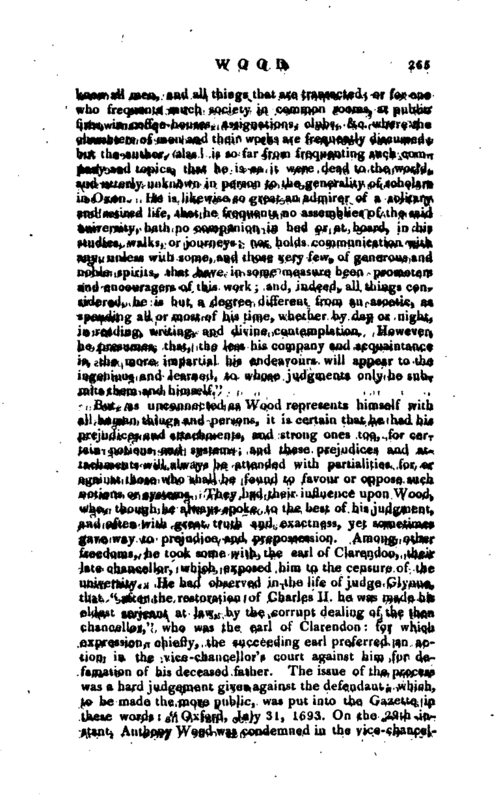 Sure I am, that the university had no hand in composing or approving those antiquities; and therefore the errors which are in them cannot de jure be imputed to the university, but must lie upon Christ-church and the composer of them.” This work, however, is now in a great measure | rescued from misapprehension by the publication of Wood’s ms. in English by the rev. John Gutch, 3 vols. 4to. 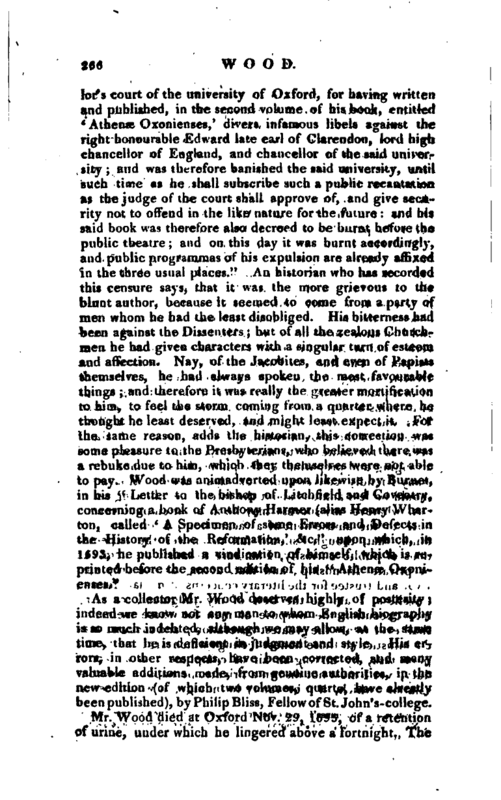 As a collector Mr. Wood deserves highly of posterity indeed we know not any man to whom English biography is so much indebted, although we may allow, at the same time, that he is deficient in judgment and style. His errors, in other respects, have been corrected, and many valuable additions made, from genuine authorities, in the new edition (of which two volumes, quarto, have already been published), by Philip Bliss, Fellow of St. John’s-college. 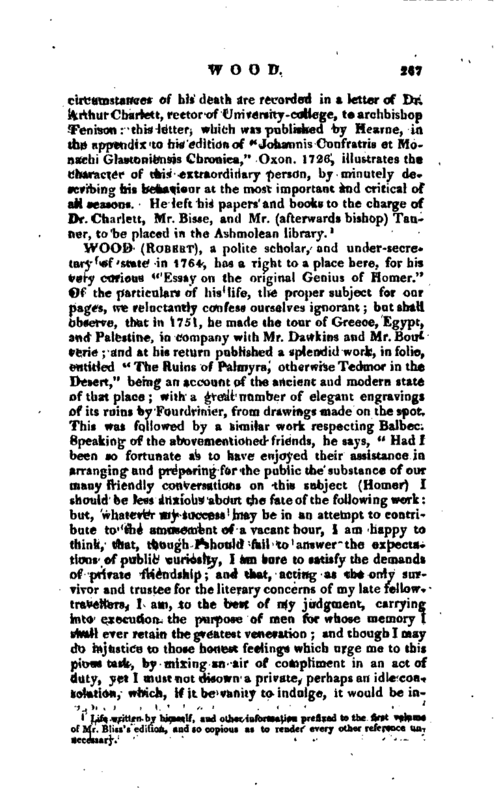 Life written by himself, and other information prefixed to the first volume of Mr. Bliss’s edition, and so copious as to render every other reference unnecessary.